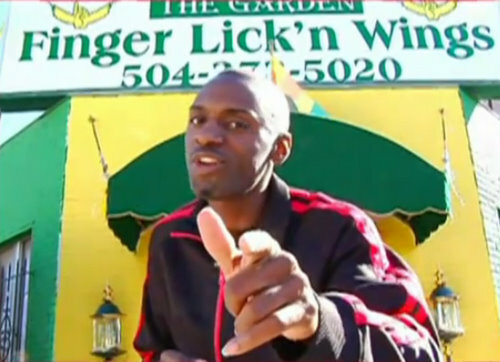 Finger Lick'n Wings owner Marlon Horton, also known in his rap career as 10th Ward Buck, invites customers to his restaurant on Jackson Avenue in this image from a commercial on his website, fingerlicknwings.com. Concerns about what neighbors described as repeated disruptive block parties at a Jackson Avenue chicken wings restaurant led the Coliseum Square Association to withhold its support for a liquor license at the establishment Monday night. The owner of Finger Lick’n Wings, Marlon Horton, has said that he originally envisioned his competition for customers as small sandwich shops in the neighborhood, but discovered that many customers prefer takeout orders or delivery because he cannot sell alcohol with his food. On game days, “it’s like crickets” in his restaurant, because sports fans are all at restaurants like WOW Cafe and Wingery that can sell alcohol. Horton extolled the good behavior of his business, noting its well-kept storefront and dedication to fighting litter, but many neighbors complain that he has frequently held large parties that consume all of Jackson Avenue. Horton replied that his local fame as bounce artist 10th Ward Buck means that any event at his store draws a large crowd, but said he was willing to sign a good-neighbor agreement to stop having any parties. The most strident opposition Monday came from an across-the-street neighbor (who left the meeting before his name could be requested for this article), who said that Horton has previously promised in meetings with police officers present to stop having block parties, but that they have continued. But similar complaints have been made in a flurry of emails that have been crossing the neighborhood for the last month, and several members of the Coliseum Square Association said they had seen little evidence to refute the block-party allegations. Ultimately, the association board voted 8-7 to oppose any liquor license application by Horton, over the objections of a handful of association members who said they would have preferred to take no action on it. His request found very little support among the association, though several members said they were enthusiastic patrons of the business and one suggested reconsidering the request down the line if the block parties stop on their own. After the association’s vote, it appears unlikely that the issue will come before the city at all. Horton has not formally applied for the liquor license, preferring to save the four-digit application fee until he was assured of his neighbors’ support. The River Gardens development, which the restaurant is actually closer to than Coliseum Square, voiced much more vigorous opposition a month ago than Coliseum Square did Monday. Finger Lick’n Wings also touches a third group, the Irish Channel Neighborhood Association, but they have been waiting on a decision first from the two closer associations. The association’s zoning committee has drafted a series of recommendations for proposed land-use classifications in the new Comprehensive Zoning Ordinance. The association approved the list Monday and plans to post it to its website soon. Roger Ivens of the Eiffel Society attended the meeting to address complaints about loud music from his venue in October. The volume of the events has been turned far down, he said, and board members noted that the upset resident seems to have been assuaged. Finally, the association noted that declining revenue from members renewing at lower levels leaves too little money for the annual Christmas party, which honors local police and firefighters. Ivens mentioned that he had been planning a similar event at the Eiffel Society and offered to coordinate his effort with Coliseum Square’s party to lower its costs, and the association seemed eager to take him up on the offer. To read a full transcript of our live coverage of Monday’s meeting, click in the box below. Mr. Horton only wants to compete with other rest. He does not want a liquor licence to throw wild parties. By state law you cannot have video poker without a liquor licence. That is his main concern because it will boost revenue that is taxed. And if he does fall into any financial problems the video poker can give him a loan. Please help small buisness out in this area. First of all I want to thank the CSA and ICNA for giving me the time to discuss my business plans. Im very proud of my business and what I have accomplished. As I admit, I did give two block parties but both were legal. One was a celebration of me opening a business in my neighborhood “grand opening”. The other was the first annual “Bounce Fest”. Bounce is music that started in New Orleans in the late 1980’s. It branched off Jazz, Blues and Hip-hop music. As Bounce grew, the block party era begganed. Originally, 2nd line music would be played in the church or clubs, but they started moving into the streets. The band would dismiss at ones home, especially after a funeral. The 2nd line becomes a gathering. With the addition of music it became a block party as everyone on the block would attend. The reasons im giving this information is because I am a bounce artist. I have come a very long way. My artist name is “10th ward buck” I have achieved so much, not discuss it all, I will say I have a book out which was released in June of 2011, I also sold some of my music to the Treme film crew and sold a song to Warner Bros. Records. Block parties is what we do to celebrate life. Its something affordable for most people. In giving these parties not once did I intend to hurt anyone. What I got out of this experience is what may be good for me may not be good for others. Lastly, to answer questions about what having a alcohol permit will do for my business. It will help me get more costumes while keeping returning seated for all events happening around the world. Being that the votes was so close with a few not voting im hoping they can find it in their hearts to reconsider and vote in support to keep my business going. Might I add that a good neighbor ageement was present inwhich I agreed to no more parties. Besides the parties theres nothing else attached to my business that is negative, so to neglect me of a permit isn’t fair. Through emails from the NOPD I was made a target but making an example out of a really good business by closing its doors is nonsense. I have nothing against the NOPD but here in our city with so much crime, once you are a target its hard to prove allegations and get a second chance. Thanks for your time. I really hope this article is helpful in understanding what I face as I transfer from entertainer to businessman. I’ve had the pleasure of meeting Marlon, though I have never visited his establishment (I’d like to!). He comes across as a genuine, eager and resourceful businessman who only wants to do right by the community. Considering how many other entrepreneurs, when faced with a similar situation, would have tried to do an end run around these neighborhood groups, Mr. Horton deserves his props for showing up at all! I wish him luck. I also feel a tad disappointed by the decision CSA (historically a very conservative group whose website is rarely updated) made to oppose Mr. Horton’s efforts – especially when his business activity does not directly impinge on their properties. I thank it’s sad that they are trying to keep a black role model down.Marlon is an example of what we should be teaching our kids. I don’t think one vote should have determine if gets his liquor license it’s really not about his block parties it’s bigger than that they hate to see a black person be successful. A restuarant that needs a liquor license to remain open is no longer a restaurant. It’s a bar. This business owner is already discourteous to the neighbors in the immediate vicinity of his business. Just imagine the impact liquor would have on those neighbors. The business owner is not the only person who has invested in the community. The homeowners have made a much larger investment by actually purchasing their homes. The business owner can simply let his lease expire and find another location for his business. Another location might welcome the loud parties and the liquor. Why make a statement like this. Its bold of you to feel one sided. Its not about closing all the time but about making it work for both sides. Understanding the neighbors, both parties should get together and make the community work as a whole. The truth is this resturant is apart of the community now so final say so should be up to the neighbors and Mr. Horton not me nor an association. The truth is that businesses open and close every day. There is risk involved with any new venture. No one is guaranteed success. The truth is that no one can point to any economically depressed area that was rejuvenated by the additon of liquor sales. If this business can be saved or shall I say try to be saved why not give it a shot? Freret Street seems to be doing well with the addition of restaurants selling alcohol to their clientele. Perhaps this restaurant should get the same chance to sell alcohol to its clientele. A restuarant that needs a liquor license to remain open is no longer a restaurant. It’s a bar. Are you serious? That’s not just a false statement, it’s a ridiculous one. Restaurants compete with each other those lacking liquor sales are frequently not economically competitive. Most of the restaurants in the city depend on their liquor licenses to survive. Or you serious? Have you ever heard of Jazzy Wings? Every restaurant in New Orleans does not operate with a liquor license. Yes, I’ve heard of Jazzy Wings. I believe they survive mainly off of catering. In any event, Jazzy Wings has gone for a “family place” demographic and Finger Lick’en wings has not. Hence, nothing changes the fact that your statement was ridiculous. Just because a restaurant depends on alcohol sales for its business plan does not make it a bar. The food industry is one of small margins, and alcohol sales are one of the best ways to make those margins work for the restaurant owner. Sometimes that small increase on the margin is the difference between a business being successful and sustainable, or the owner giving up on the enterprise. So is the Irish Channel lacking in places to purchase liquor and play video poker? I am happy to have more places to eat, but I don’t see how another liquor license that close to a school is a good idea. Isn’t the license to serve liquor is attached to the building not the individual. While this gentlemen seems to be honest and committed to the neighborhood, the next owner may not be. Understanding your concerns, I can only speak for me and my business which exist now. I want the chance to progress and grow and there’s more to it mainly “income” if this is a legitimate reason to want a permit. Lastly its not against the law or illegal for a resturant to have a license across from a school. Thanks for you input though, its a better debate when both sides are looked at. If I can add input. It seems as if parties are the problems well how bout reaching out to the neighbors acknowledgeing that there will be no more parties. I’ve heard alot about this place and hate to see them lose the fight to stay established fot something fixable. As a customer, I would love to see this place expand. I was once on the outside looking in but until you actually visit this place you wouldn’t understand the importance. From the food to the lay out, it all surpassed the expectation I had. My support is with my Horton, im hoping the music situation get resolved. Might I add I stay in the neighborhood. I’m still wondering why it is so difficult for this business to get an alcohol license when there are obviously other businesses in the area that seem to get along selling alcohol just fine. Did the neighborhoods fight those establishments as strongly as they are fighting this one? Because I seem to recall that one of the biggest annual block parties in the city happens just four blocks away. I don’t see the point in the debate on this article. Mr. Horton democracy has prevailed, and you lost CSA’s vote.